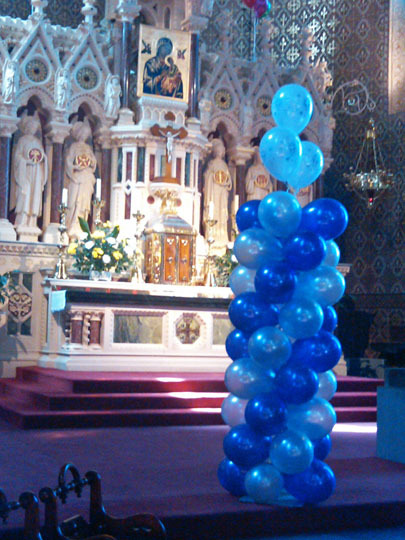 Yesterday, following the 1:10 p.m. Mass, donated helium balloons were brought in and anchored to every pew and on top of each confessional. Pirouetting columns of them flanked the icon of Our Mother of Perpetual Help in the sanctuary. Setting up for the "Blessing of Babies and Young Children" service had begun! A children’s religious cartoon was playing on the video screens mounted on the church pillars, as well as those in the overflow room. And then they came: in strollers, in parents’ arms, in full volume! 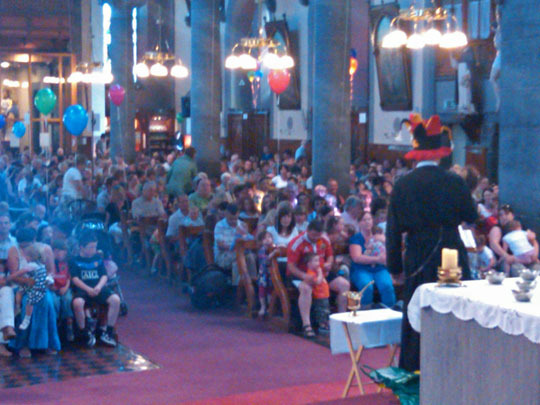 The rector, Father Adrian, 47, had all the energy of Barney as he literally pulled out of a bag of tricks different hats and a hand puppet to the amusement of kids and parents alike. And yes, we crooned the purple character’s signature song, "I love you." There was a Gospel reading and a short talk, and then the actually blessings: of children deceased and for their grieving parents and grandparents; of children ill and not able to attend; of families desperate to have children. Finally, 12 Redemptorists handed out medals of St. Gerard as we blessed each baby and child. 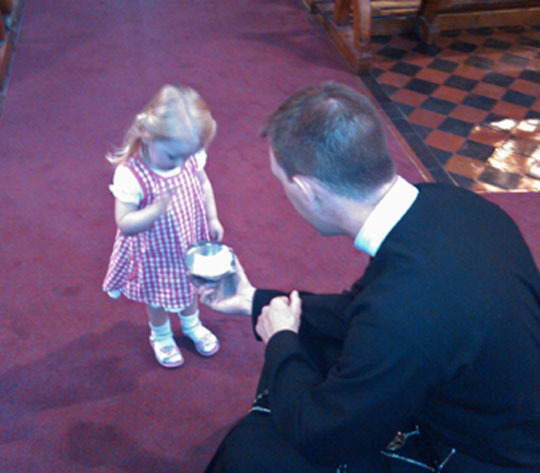 I don’t know what moved me more: the young lass with wide eyes, or the old Redemptorist bending down with paternal care on Father’s Day. It’s the summer solstice today, and the irony is that these are very long days no matter what during the Novena. Thank God we have help! I think of Theresa, chief steward (the head usher) for the novena. She has an amazing story. More than 30 years ago, she lost her child who was only 14-months-old. Three months later, she arrived to pray at the novena with her 2-year-old girl and asked Mary to give th at daughter a brother. She gave him five! She hasn’t stopped volunteering since! The story of how the Novena came to Ireland is fascinating. In 1866, Pope Pius IX commissioned the Redemptorists to make Mary known under the title of Our Lady of Perpetual Help. In 1916, the American Redemptorists celebrated the 50th anniversary of that event by establishing a perpetual novena, that is, a weekly celebration of the novena. Eventually a young Redemptorist by the name of Father Matthew Meighan became the novena director. When the U.S. entered World War II in 1942, Father Meighan joined the U.S. Marines as a chaplain, and quickly found himself posted to Northern Ireland in 1943. When visiting Clonard Monastery in Belfast, he urged the Redemptorists to establish a perpetual novena. The first session was held December 9, 1943 in Belfast and quickly spread to other Redemptorist communities in Ireland, especially Mount St. Alphonsus in Limerick. 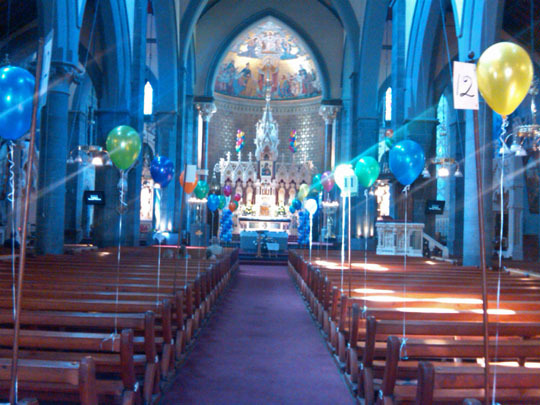 In the late 1970s, a team of Redemptorists from Mount St. Alphonsus, led by Father Vincent Kavanagh developed the novena even further, giving it the particular festive atmosphere and popularity it enjoys today. — Rev. Daniel Francis, C.Ss.R.